In the latest in a series of Meet the Author Interviews I talk to James Hannah about his debut best-selling novel The A-Z of You and Me which is published in paperback today by Doubleday. I must begin by asking as a debut novel how did the idea of The A-Z of You and Me come about? ‘For long and complex reasons which I’ve just explained in full and now deleted, I happened to be thinking about forces and structures to which we are all subject. Everybody uses a language, and everybody has a body of some description. It was a short hop to wonder what it would be like if you took a Gray’s Anatomy reference book and read it from cover to cover to find that the ‘body’ being anatomized was an actual character with a dramatic back-story. So that’s where the kernel of the book came from. From there I engaged in a mechanical process of answering the questions that the structure posed: Why is our character dividing up his body like this? Answer: he’s playing a listing game. Why? To occupy his mind. Why? His mind is fretful. Why? He’s gravely ill. Why? How challenging did you find the premise of the story line connecting body parts A-Z and flashbacks of the leading character ‘Ivo’? ‘Persuading the whole story to flow and connect was initially surprisingly easy and eventually surprisingly difficult. I was happy to relinquish control of precisely what happened to Ivo, so I was happy to be guided by whatever body parts were around at the time. 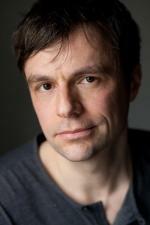 Whatever stories I thought of, that’s who Ivo is. The obvious place to start was at the difficult letters: what was going to happen at Q? X? Z? So these were the body parts I started with, and I retrofitted the rest of the alphabet around the more stubborn plot points. The further I progressed, however, the more the story began to take over and strain against the body parts. The example that always leaps to mind is ‘G’. It became apparent that the ‘love/romance’ plot (between Ivo and Mia) needed to get moving at around the G section. Any sooner and I wouldn’t have had to time to establish other elements; any later and it would become too much of a squeeze on the rest of the plot. ‘G’ is, it so happens, a singularly unpromising zone of the body-part alphabet to get any kind of romance going. So, establishing Ivo and Mia’s relationship took some creative mirroring and echoing across the E, F, G, H sections. It was very hard work. It is story of love and regret but with some wonderfully funny moments, was the storyline a difficult one to write? How long did it take to write The A-Z of You and Me? ‘I felt my primary task in choosing this already-sad subject was to realise it in as kind and funny and humane a way as possible. That generates pathos, which helps in contemplating certain awful situations; it’s still possible to smile when you’re crying. I owe it to the hospices that have hosted such experiences in my family’s life to represent them without melodrama. Rather than being difficult, writing The A to Z of You and Me served as a way to process the grief and other experiences my family and friends have been through in recent times. Certain elements of the back story – the plot involving Amber and the woman in the room next door – emerged unbidden to coax my main plot into a better, more progressive place. I tend to have a couple of books on the go at once, one non-fiction and one fiction. The non-fiction book I most recently finished was ‘Threads’, the biography of artist/fisherman John Craske by Julia Blackburn, which invades and occupies your mind in a quite fantastic manner. One can only aspire to generating such a connection with one’s subject. Aside: Do you think the pronoun ‘one’ will soon be obsolete? Or is it the gender-neutral answer we’ve all been asking for? Discuss. Fiction-wise I’ve just finished the soon-to-be-published The Trouble With Goats and Sheep by Joanna Cannon, a cautionary tale of curtain-twitchers who take against one of their number. Keep and eye out for it; it’s really sparkily written, thought-provoking and compassionate in its portrayal of difference in suburbia. Are you writing a new novel and will this be something completely different to that of your first book? ‘At the moment I’m concentrating on being a good husband and father after many years of editorial hair-tearing, hand-wringing and head-hanging. And that’s just the Hs. 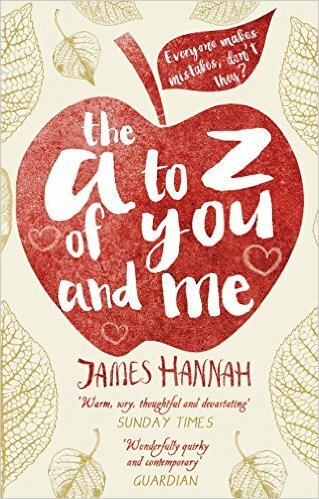 Posted on August 27, 2015, in James Hannah, Meet The Author, The A - Z of You and Me. Bookmark the permalink. Leave a comment.